Offering you a complete choice of products which include monorail hoist and monorail crane. The Monorail Hoist needs to have many standard features you expect from product traditionally know as options on most electric chain hoist manufactures. 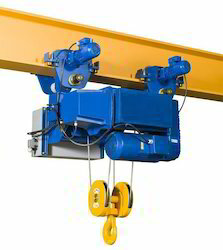 An Electric Chain Hoist must be design to integrate into a system of choice. These Monorail Hoist include Overhead Bridge Cranes construction Bridge Crane Kits, Rail Systems, to a standalone unit on a Jib Crane or Gantry Crane. Trolleys must provide smooth movement of load and create low resistance movement I beam girders. Monorail Crane are more commonly known as "motors" in the industry of entertainment. They are used in applications such as; lifting or fastening overhead truss systems, arrays for lighting and speakers. Monorail Crane can assist in carrying heavy freight from one location to the other with a simple push of a button. The Monorail Crane turns out to be extremely cost effective in the long haul. Money does not need to be spent on hiring professionals to operate the apparatus as it can conveniently be managed by an amateur. Investing and squandering money on chain hoists is very reasonable since it can help obtain maximal productivity at low costs, and this is guaranteed. It also saves immensely on labour expenses and time, which is precious. Electric Chain Hoists are highly endorsed and preferred in each and every premise.